En route to the station I walked past our local M&S where the external sign has been reading F OD HALL for sometime now. I attempted to engage a young man with a mirthful witticism. He was bent over a large vowel swathed in clear plastic which he was slicing off with a knife ready to re-attach to the sign above the entrance. "Got any Os?" I lobbed. Donny is not the prettiest town in England. Considering its relative Victorian affluence and later railway heritage, swathes of the town are architecturally anonymous and barriered by road infrastructure. And yet there a whiff of ambition in the air. Robin Hood Airport, opened in 2005 on the old RAF Finningley airfield is a success; the new Keep Moat Stadium is home to Doncaster Rovers and a raft of other local pro sports teams; and the Frenchgate Shopping Interchange is a reasonably attractive and popular new shopping centre. I later read of plans to create civic and cultural quarters in the town centre and raised an eyebrow. Alongside these worthy constructions, the £36m redevelopment of Doncaster Racecourse in 2007 is a lot closer to my heart. Although owned by Arena Racing, the Council earmarked work at the racecourse as one of its seven transformation projects to regenerate Doncaster. The project rolled out during a turbulent time for horse racing as the original and ground-breaking At The Races media rights deal collapsed and as internet betting began to take off. It was delivered as a joint venture between Doncaster Council and Arena Leisure. The Council was very aware of the potential of a revamped track that would boast a state-of-the-art grandstand, exhibition and conference centre together with a new on-site stables complex, weighing room and accommodation block for racing professionals. Plans also included a four-star business class hotel. It never got built because the tumultuous betting industry backdrop to redevelopment soon gave way to a far deeper malaise in the economy more generally. Now, the mothballed project is being revived. The Council is talking to developers about building a 150 bedroom complex on the site of the former weighing room. The three of us admired the new five-tier grandstand. It is an attractive, spacious and well appointed structure with excellent sight lines and plenty of seating both inside and out. The terraces provide thoughtful viewing areas and unlike many other new racecourse developments, the best bits of the stands are not just the preserve of VIPs, life members and corporate hospitality. Joe Punter is not squeezed into concrete cattle sheds here. I met Dad and Bruv in the Lazarus stand where we had acres of tables, large screen tellies in every direction and access to a split level outside patio. All that was missing was the hot tub. 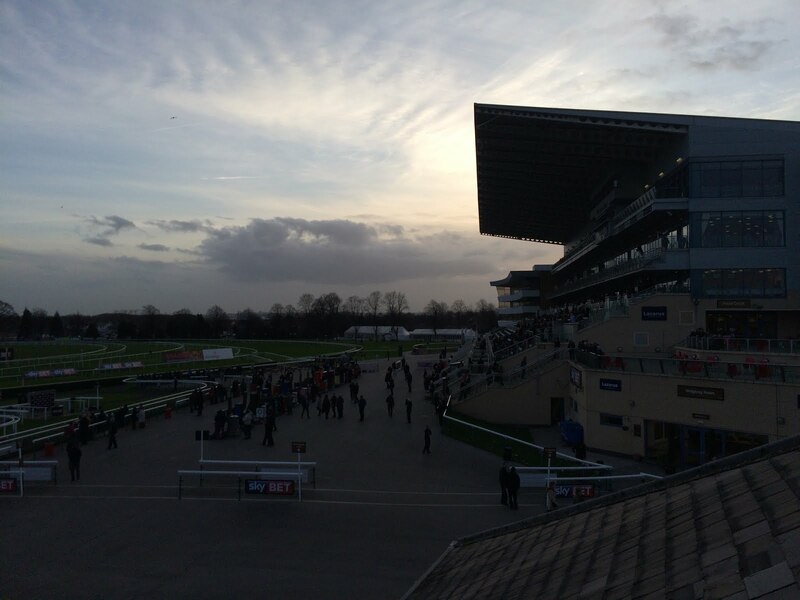 In Town Moor racecourse, Doncaster has something of which to be genuinely proud. And this was my first visit. Unforgivable for a Yorkshire lad. On the way out to outside seating, Bruv gave a nod of approval and said "You can really tell the difference between a Grade I and a Grade II track!" 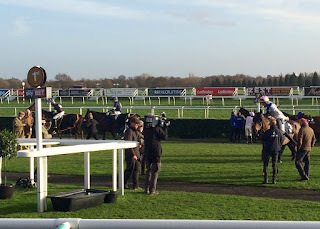 Tired old Wetherby is their most frequently visited racecourse. My appreciation of the place went up even further when I tried to find somewhere to dump my lumpy rucksack. "Do you happen to know if there's a left luggage anywhere hereabouts?" I asked an under-occupied woman in one of the spacious Tote booths. "I'm not sure. You could ask in the main reception." She peered at me over her glasses, weighing me up. "OK, thanks. I don't really want to lug this thing around all day." I shook the backpack with a tired looking shimmy. I was pleased to note that the Tote uniform has returned to its traditional bold pillar box red instead of the vile lime/grass green combination of recent years. Maybe they'll go back to recruiting all their staff from Newcastle and its environs too. Just like the 90s. "Here, I'll take it." She had obviously decided I wasn't a terrorist. "I'll pop it down there with my coat. I'm here til 15 minutes after the last race". I was touched and made sure to place all my Tote bets that afternoon exclusively with her. "He's getting third!" I thought I was watching the wrong horse. Hardly reckless punters, Dad and Bruv have recently adopted a careful strategy of only backing in races once their Placepots are down. I scoffed insufferably until Bruv described his healthy strike rate. That shut me up. I have an appalling record. Landing the Placepot on that card seemed like a taller order than ever. Every race bar one had 16+ runners and there was a fair smattering of impossible handicaps and unfathomable maidens. So it proved. I made it to race 3. Something of personal record. The others faired little better. The pool eventually paid out £172 to a £1 stake. That said, there was a lot of rubbish in the 18 runner novice hurdle and between us we had whittled it down the three live chances. Why we didn’t perm them I’ll never know. Two of ‘em came home first and second: Cyrius Moriviere for the upwardly mobile Ben Pauling and Moabit for Paul Nicholls. Dashing Oscar, whom I finally settled on, finished no-where. My only winner of the day was Keith Reveley's Night In Milan. A twice winner at this track over fences, even Bruv couldn't put me off with his remark that the horse was being sent over hurdles today merely "as a Grand National prep, Dave". He came smoothly clear down the home straight and never looked in danger, despite my urgings towards James Reveley to “watch out and get flippin’ busy”. No need. 7-1 looked a steal after the event. There was a nice moment after the race. George Moor had just seen his last ever runner, Wolf Shield, come home safe and sound. Moor was interviewed in the winners enclosure about his retirement after giving 31 years to the game. He went out with a couple of Northumberland Plates and a Royal Ascot winner under his belt. The horse my Bruv remembers best is Pagan Starprincess whom he managed to back at various odds between 7-1 and 28-1 on each of her hurdle wins. All his horses have been moved on. And everyone he employed at the stable has been found a job. On the downside, there is no-one to buy his Middleham training facility which is being broken up and sold off in chunks. Much like Ferdy Murphy's state-of-the- art place was a few years ago. This leaves Micky Hammmond as the last credible jumps trainer in Middleham. Even that is stretching a point. The flat business is thriving in Yorkshire, but the jumpers are very much the poor relation. A sad decline which sees no prospect of reversal. We went off to fetch refreshments, leaving Dad to mind the seats. "We'll try to bring the tea at the same time", we said to him as we headed for the sandwhich bar. "Don't worry", he called after us. "You can allas go back again. He! He!" The five-runner 3 mile novice chase had the potential to be informative, with useful runners from Nicholls, Fry, Curtis, King and Richards. However, the race was over as a spectacle early when The Tourad Man fell. That hampered Saint Roque into a bad mistake who was pulled up almost immediately. Vintage Vinnie, whom I had backed at Cheltenham in October where he came down, jumped much better here and looked like giving favourite Thomas Brown something to worry about. The improved fencing didn’t last long though. Vinnie hit three out and Thomas Brown stayed on fairly well to win. Harry Fry’s yard has been bang out of form. They’ll take this result, although there’s a suspicion it was gifted to them. Safe to say there were no RSA Chase winners in this field. We had seen Alex Ferguson’s chopper land in the centre of the track before racing. Now he and the rest of his entourage were attracting attention as they came back from the parade ring, passing the rails bookies. Fergie did his best to sign every autograph and pose for every selfie with something passing for good cheer. 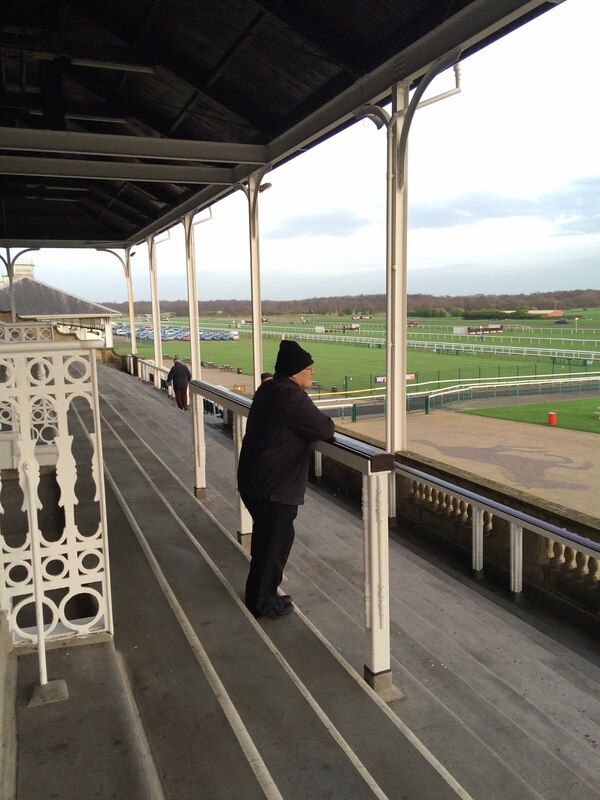 All he really wanted to do was look at the prices of the opposition to his horse, Rainy City, in the maiden hurdle. One of his crew sidled up to him and handed over a slip procured from Wensleydale Bookmakers’ pitch. I didn't see how much folding stuff had changed hands. Fergie was getting fed up with the attention by then and the gang headed over to the owners bar. Bruv and I watched this heat from one of the two remaining Victorian stands at the track, up by the one-furlong marker, where there is a great view back to the new stands which angle out into the sharp turn just past the winning post. Having the parade ring in front of the stands adjacent to the track is a simple way of engaging everyone with the theatre of dispatching the runners and greeting a winners back in without having to charge from behind the grandstands to the track. We need more of this. In front of our stand was an attractive family enclosure, used primarily during the track’s extensive flat season. In 1992, Doncaster staged the first ever Sunday meeting on a British racecourse. Sunday trading laws prevented any on-course betting. Despite this, a crowd of 23,000 turned up. Many of them were families who brought their own picnic chairs, flaky sausage rolls and warm lemonade. The day played an important part in setting to the tone for family friendly Sunday fixtures that have since become a staple of the Summer. It looked like Fergie’s appearance at the track was a sign we had failed to take. His Rainy City moved smoothly to lead at two out. However, he tired alarmingly quickly and Alan King’s Big Chief Benny asserted close home. I’d confidently napped Royal Milan who was being given his second start over hurdles by that nice Philip Hobbs. However, the anticipated improvement eluded him completely. Disappointing. In the last race both Dad and Bruv found a rare jump winner from the Richard Fahey stable. In an ordinary novice handicap hurdle, Quill Art managed to make his previous experience tell and won a good tussle with the only other horse in the race who could claim any form at all, Mazovian from Neil Mulholland’s team. For my part I backed a Jonjo O'Neill rag on the basis that he had been saved for a handicap touch. I was very wrong. Nevermind. With each of us claiming winners on the day and avoiding an utter mauling, we easily justified large haddock, chips and mushy peas from Whitby Fisheries over by the carpark. Lightly battered: a fair reflection on the day’s punting.